My Papa Ross landed on Juno Beach and moved on to help iberate Holland in 1945. His two brothers' stories were very different: one brother was sent to defend Hong Kong aand then spent four years as a POW in Japan. The youngest Ross boy joined the RCAF - and was sadly killed while training in England. I gathered information from an extensive variety of sources: interviewing different family members, travelling to the War Museum in Ottawa to see the World War II exhibits, various books and magazines from my dad's personal library and the school's, my Uncle Lance's war diaries and his time as a POW, an interview with a local WWII veteran (Mr. Crawford), various family photos, documents and artifacts from the war, Veterans' Affairs video files and other sources on the internet. Through my research I realized that my Papa Ross's story and his two brothers' stories are not only my story - but Canada's story. Why is your topic important in the history of Canada? My topic is important to Canada - and my own perrsonal history - because it shows the significance of my family's contributions to the war effort during the Second World War. My grandfather landed on Juno Beach, pushed inland and then was part of the foreces which liberated Holland - known as the most "significant event of the twentieth century". This is my family's story..and also, that of my country! My great uncles also made significant contributions to the war effort through their actions in Hong Kong and in the Royal Canadian Air Force. Uncle Lance paid a horrible price as a prisoner of war in Japan. Uncle Stewart sadly lost his life in training overseas. Their stories remind us all of the terrible costs of war. Why should Canadians today care about your topic? My family's stories from World War II are shared by many other Canadians. Their stories of Juno Beach, life as a POW in Japan, and a member of the RCAF are truly "national" stories which all Canadians should know. Their stories will never be forgotten. It is part of Canada's history - and my family's history. 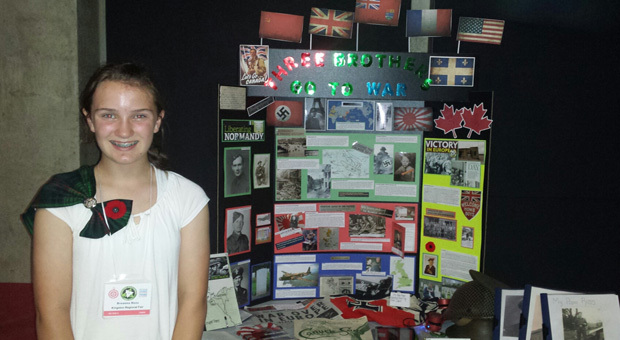 Breanna won the gold medal winner at the grade 7 level and represented the Kingston Regional Heritage Fair at the Provincial Fair in Toronto in June 2015.